Three men standing over a grounded, light coloured ox, one at the rear holding a tether tied to its back legs, and two at the front holding its head. The two youths at the front of the ox are wearing European style clothes and were probably involved, possibly as translators, with the district headquarters at Abwong, which is where the film number suggests this image was taken. The youth facing the camera seems to have Dinka scarification marks on his forehead. Manual Catalogues [index taken from album book XIII, ms ink] - 24. 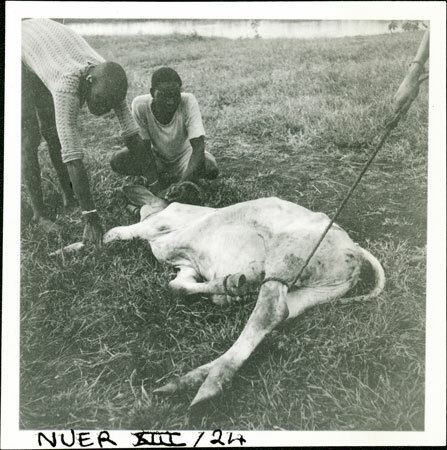 Grounding ox (Dinka?). Note on print reverse ms pencil - "28 2 A200" & print front border ms ink - "NUER XIII/24"
Morton, Chris. "Grounding an ox" Southern Sudan Project (in development). 03 Jan. 2006. Pitt Rivers Museum. <http://southernsudan.prm.ox.ac.uk/details/1998.355.612.2/>.